Northeast Delta Human Services Authority (NE Delta HSA) has partnered with Outpatient Medical Center Inc. to expand much needed behavioral and primary healthcare services in one of America's most impoverished areas. As a result of combining efforts, NE Delta HSA and Outpatient Medical Center Inc. will be able to further leverage efforts and provide an array of comprehensive treatment and prevention options. NE Delta HSA currently has formal agreements in place with the majority of the region's rural hospitals and federally health qualified (FQHC) organizations. 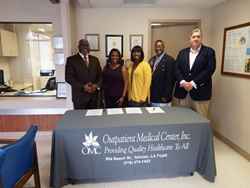 "We are excited to partner with NE Delta HSA," said Mr. Carl Walters, II, CEO, Outpatient Medical Center Inc. "Our newly formed partnership is consistent with our commitment to provide our patients an even greater array of medical, dental, vision and behavioral health services." The Outpatient Medical Center Inc. will serve as a referral and resource for individuals seen at the Tallulah Behavioral Health Center who presents with a primary care or dental need. Mr. Walter's added, "Our newly-formed inter-agency partnership will help ensure our valued Madison (and surrounding) parish families have access to the high-quality; cost-effective; culturally-sensitive coordinated medical and behavioral health services they deserve." NE Delta HSA has made it a point to work across racial, political, income, denominational and governmental lines in order to solve problems on behalf of the region's people. Helping to find a solution to major behavioral and primary healthcare gaps is no different. Literature on integrating mental health and primary care services through proper assessment and referrals indicates a strong increase in access to care, patient-provider satisfaction, and cost control. "At NE Delta HSA, we are focused on solving problems," Dr. Sizer said. "We understand the complexities of human relationships and disproportionate impacts caused by those strained relationships and broken social systems. However, I believe galvanizing around quality healthcare and expanding life opportunities for all can get us closer to that one Louisiana we have dreamed about." To learn more about our behavioral and primary healthcare work, contact Wellness and Prevention Services Director, Dr. Avius Carroll, at 318-362-5230 or via email Avius(dot)Carroll(at)LA(dot)gov. NE Delta HSA manages the operation of community-based programs that improve the quality of life for individuals with major mental illness, developmental disabilities and addictive disorders. NE Delta HSA accomplishes this by utilizing a nationally recognized integrative approach that identifies and addresses behavioral and primary healthcare needs. NE Delta HSA is devoted to delivering programs and services that encourage citizens of Northeast Louisiana to reach their full human potential. Three tenets guide these efforts: excellent customer service, greater access to services and competent, quality care. We serve Caldwell, East Carroll, West Carroll, Ouachita, Lincoln, Madison, Franklin, Morehouse, Jackson, Tensas, Richland and Union Parishes.